Andrew’s thoughts: Independent of all else, I like the three-headed package of Wil Myers, Jesse Winker, and James Paxton. I’m a pretty big Myers fan and as he’s just 25-years-old and in the midst of what appears to be his breakout season (he’s very quietly a top-40 overall fantasy hitter), see him as a better bet than most any prospect. He’s $12, but that’s really a fantastic price for what he’s doing and the potential he has. His only big question marks are his ability to stay healthy and how much appeal he loses after this season, when centerfield eligibility is gone and he may only be able to slot in at 1B. There are positive question marks too though. If the San Diego Padres opt to blow their team up — and they should — Myers is their one big chip. They’re more likely to try to build around him, but their roster is so bad that odds aren’t good they can re-build it in time to compete with him still on it. If he gets moved to any other ballpark, he ticks up. Winker’s a nice piece whose bat should play up at Great American Ballpark, which may as well be the Midwest’s Coors Field. I’m only slightly down on him because he’s likely a left fielder only, and LF might be the easiest position to fill. That’s nitpicky. And Paxton is, to me, a fine dice roll as part of a package heading to a rebuilding team. He costs $3 now and $5 into 2017, which is basically nothing, and does have some track record of MLB success. 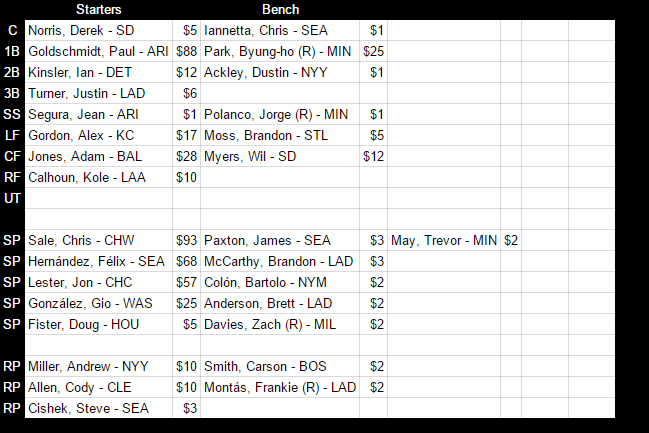 Having said all that, I don’t think it’d be unrealistic to see those three players swapped for $16 Jaime Garcia alone. Granted, I’m a big Garcia fan. I’m likely the high guy on him in our league. And I know he’s super prone to injury and has scuffled over his last four or five starts. I’m not saying Myers/Winker/Paxton for Garcia is perfectly even, but if that trade gets consummated, I’m not really scratching my head. You might see where I’m going with this. I haven’t gotten to Bryce Harper yet. To me, this is another example of Harper being undersold. I just don’t think there are enough pieces. Or maybe there are too many pieces, with Garcia being the superfluous one. Obviously, if I think the return (I’m considering Zunino a throw-in and nothing more) is a fair trade for just the guy being included with Harper, I can’t justify saying the package is good enough for Harper alone, much less Harper and a 27 point per game starting pitcher that only costs $16. Maybe Myers/Winker/Paxton is an okay baseline for Harper, all factors considered. It just looks, to me at least, like Garcia was dumped in here for free. Again, I don’t think Myers/Winker/Paxton is a bad starting point. Maybe there are so few pieces so as to keep negotiations simple. But I once again think Harper was sold without the seller sapping every possible morsel of value. I don’t care that Harper costs $109 now and will be $111 next year. He’s so transcendent a talent, you can make that work. I also look at Squids’ roster and see plenty of easy cuts that could be made to keep Harper (with $2 raises, the combined salaries of Revere, Parra, Martin, Grichuk, Inciarte, and Colabello will be $108 in 2017, or $3 less than just Harper), so it’s not like — especially in June — clearing his salary was an urgent matter. Over the next three seasons, The Foundation has six second-round picks and a first-round pick in 2019. If I’m Squids, I want to tap into those. I want Jeff Hoffman, a cost-controlled pitching prospect with enormous talent who will have to throw in an admittedly crappy home park, too. I probably want Brett Anderson, a perpetually injured $2 pitcher that can be safely stashed on the DL and decided on later. I want Zach Davies, a decent $2 flier that could provide depth to my rotation. I’d like to snare one more prospect piece as well, maybe Braves’ minor league shortstop Ozzie Albies, who reached Triple-A at just 19-years-old. Squids is also down $20 of auction budget next year. Why not ask for The Foundation to reimburse some of that? The point is, I think once you’ve got the key components of a Bryce deal ironed out (Myers/Winker/Paxton), you can probably ask for all or most of those things and get them included without it grinding all the gears to a halt. That’s not nickel and diming. Most of those things listed above aren’t hot commodities that would’ve hurt Jordan to part with. But if you’re selling one of the most prized pieces in the game (plus a solidly above average pitcher! ), you need as many potentially useful pieces as possible. I wouldn’t necessarily advocate holding out for every last drop every time you make a trade, but when you’re trading Bryce, or Mike Trout, or Clayton Kershaw, etc, then yeah. Interesting to note: to date, Harper, who like Myers will also likely lose CF eligibility after this year, has been worth just 43.2 more points than Myers. Come the end of the year, I expect that gap to be significantly larger and I realize that using just net points is a rather dumb measure of anything. But Monday morning we’ll be exactly halfway through the regular season and barring a monster weekend, Harper will only be something like 4-5 points/week better than Myers, but with a salary $97 higher. Just interesting, is all. I guess the point is that Myers is really quite a valuable asset.